A good friend of ours shared this event with us. Her words follow, “Though the organizers of the event are apparently right leaning they ask that hosts commit to NOT tying the event to an organization or campaign. I’m trying to make the point that our Constitution is neither left, nor right, nor the center. It’s the big umbrella under which we all live as citizens in this country. It is the guardian document of our liberty and the word WE is a big WE which means you and me and our neighbors and the community in which we live. I would be honored if you chose to join in this project whether as a reader on stage or in the audience. I checked in with the Ligonier Borough office and made a reservation for the auditorium with plans for the reading starting at 5pm. I have no idea how many people might want to participate but I’m thinking it will be more than my office or front porch could handle. I truly think it would make a strong statement of support for liberty if we demonstrated through our diversity of opinions and political positions or lack thereof that we respect each other and the Constitution. Saturday, September 18th at the Ligonier Town Hall. 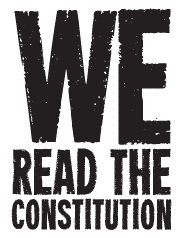 This is an open event and a non-political, nonpartisan, simple exercise in the reading of the Constitution of the United States of America. Reading will begin at 5pm. For more information, contact Diane Cipa 724-238-7783.